On the 21st of April 1871, William A. Hancock filed the first homestead patent to be recorded at the Arizona Territorial Capital in Tucson. His quarter section of land was then but a remote piece of desert, miles from the infant settlement of Phoenix taking root along the banks of the Salt River to the south. Today, that land lies within the heart of the city and contains a residential neighborhood that is an oasis in the bustling core and a showplace of Phoenix history, development, and architecture – Del Norte Place. In 1912, the Territory of Arizona became the 48th state to be admitted to the Union. For the previous 19 years, Territorial Veterinarian Dr. James Collier Norton had served under seven governors, overseeing the health of the district’s growing cattle industry. With statehood granted, he resigned his government post, establishing a dairy and constructing a home on the historic Hancock homestead, which Norton had purchased at the turn of the century. A visionary, Dr. Norton had anticipated residential development on the southern half of this land. Shortly after purchase, he planted prospective gridded streets with tamarack, ash, and orange trees. With completion of his home on the property’s northern edge, a large two story Mission Style structure he called Del Norte House, the scene was set for development. The post war boom of the “Roaring Twenties” signaled growth and prosperity throughout the country. Phoenix was no exception as Arizona cotton was in high demand. By 1920, the downtown core was well developed, and a northward pattern of residential construction had been established. However seasonal flooding down the Cave Creek wash stymied growth between Central and 23rd Avenues, in the flood plain area where the Norton property was located. In 1921, a deluge force Phoenicians to confront the problem. By 1923, construction was complete on the Cave Creek Dam and canal system, bringing both flood control and rapid development to this dormant cut of land. By 1927, the country had discovered the therapeutic benefits of the Arizona climate, Lindberg’s Atlantic crossing popularized flight, and regular air service to Phoenix brought visitor s and settlers alike. Now plotted, tree lined and flood free, Dr. Norton’s dream, Del Norte Place, was perfectly positioned for residential development. Still just outside the city limits, Del Norte Place received additional impetus from the benefits of “leapfrogging,” a strategy of building outside the restrictive reach of city codes and taxes, then subsequently annexing to obtain municipal services. On April 3rd, 1927, Del Norte Place was opened to the public. 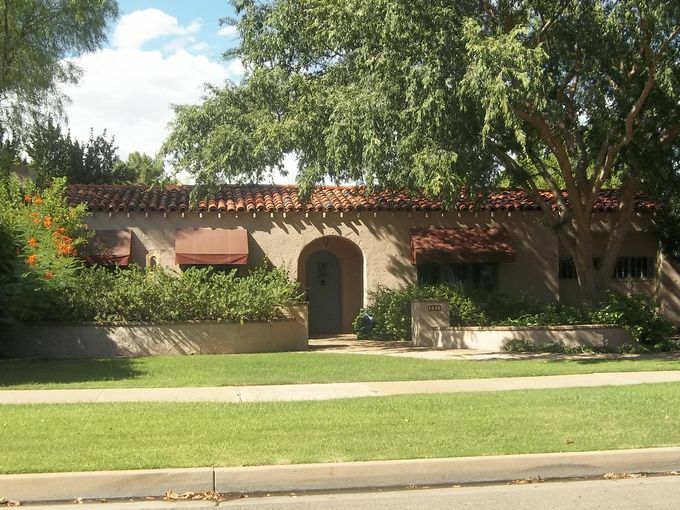 Platted between 15th and 17th Avenues, the original Del Norte subdivision was created in 1927 and contained 84 lots bounded by Lewis Avenue on the north and Encanto Boulevard on the south. Two years later, a second subdivision would extend the district to its current northern boundary at Virginia Avenue. 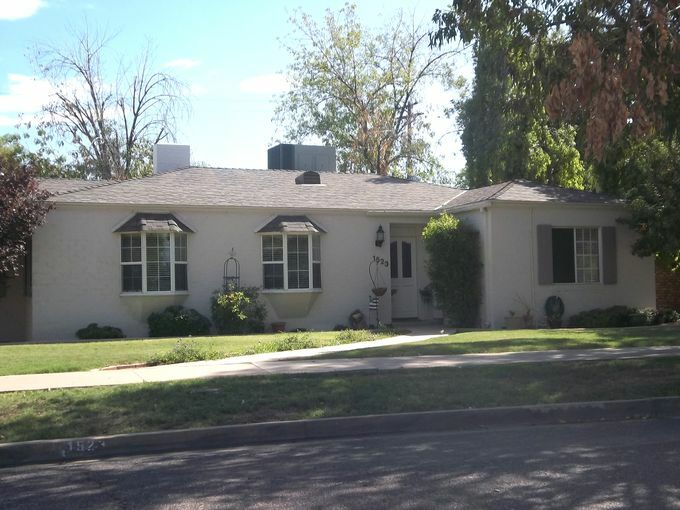 Promoted as the “beautiful subdivision” and “the countryside west of town,” Del Norte was conceived as a historic neighborhood of English Cottage Style homes, an architectural revival that was gaining nationwide popularity in the late 1920’s. The mature trees and vegetation of Del Norte reinforced this English imagery and helped promote the style throughout Phoenix. The homes, priced at $5,000 to $7,000, were constructed of red birch with contrasting brick trim and steeply gabled roofs. Del Norte was off the trolley line, and as many owners were already driving automobiles, most homes were constructed with accompanying garages. Teaming with Dr. Norton in the early development of Del Norte was J. Allen Ginn, Sr. A nationally recognized horseman, Ginn moved to the valley from Texas in 1921. He served as architect builder, and sales agent for the initial phases of the project and was featured prominently in promotion of the development. Gin’s architectural styling was on the cutting-edge of a rapidly shifting market and helped secure the early success of Del Norte. This success, through the end of the 1920’s, was part of an overall wave of prosperity throughout the Valley. In addition to the residential boom, public and commercial development was abundant. The Biltmore Hotel, The Heard Museum, Phoenix College, and the Orpheum Theatre were all developed at the end of the decade. 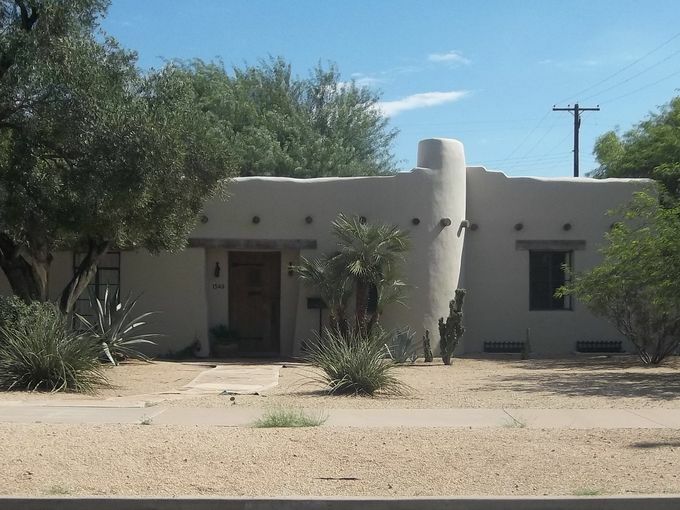 Del Norte was one of the last Phoenix neighborhoods created by one individual who exercised complete control over planning, development and marketing of the project. With the 1930’s came the Great Depression. And while the strength of the local economy withstood the initial assault, the growth of Phoenix eventually waned as it had throughout the nation. Ten houses were completed in Del Norte from 1930 to 1931 with construction of the next ten spread over five more years. The slowdown halted the efforts of Norton and Ginn, and the team ceased to be a force in the completion of Del Norte. The legislation accomplished all of this and more. Under the wing of the Federal Housing Administration (FHA), generous loan programs brought home financing within the reach of a broad range of the American population. On the strength of this support, a new generation of developers, contractors, and realtors came to prominence in the Valley. Development and construction resumed on a large scale. Existing projects blossomed as well. The years from 1936 through 1941 brought the Del Norte neighborhood the most rapid development in its history. A total of 77 of the district’s 151 homes were constructed during this period. Inevitably, government assistance was accompanied by government controls. As FHA financing brought new life to Del Norte, FHA design standards brought a new look. Simplified versions of the Period Revival styles emerged. They were accompanied by adorned versions of earlier Period Revival styles, notably Spanish Colonial Revival and Monterey Styles representing more regional, southwestern influences. 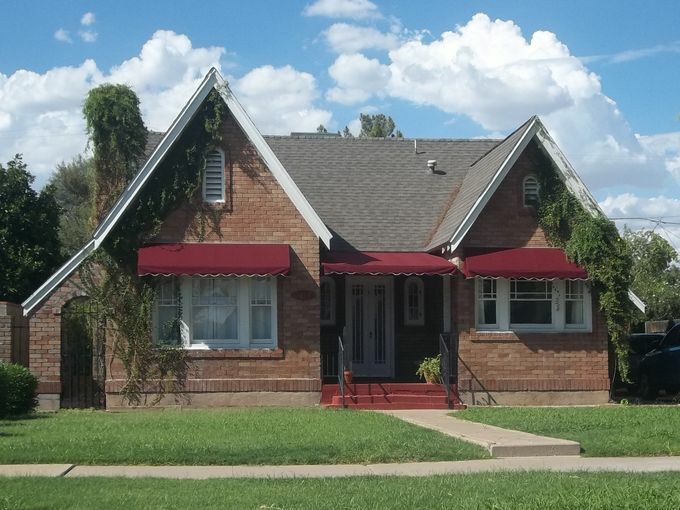 These homes were typically one story, stuccoed brick dwellings with low pitched tile roofs. Ornamentation was generally limited to modest tile work, accentuating rooflines and doorways. During this phase, an alternative to the Period Revivals styles also gained in popularity. 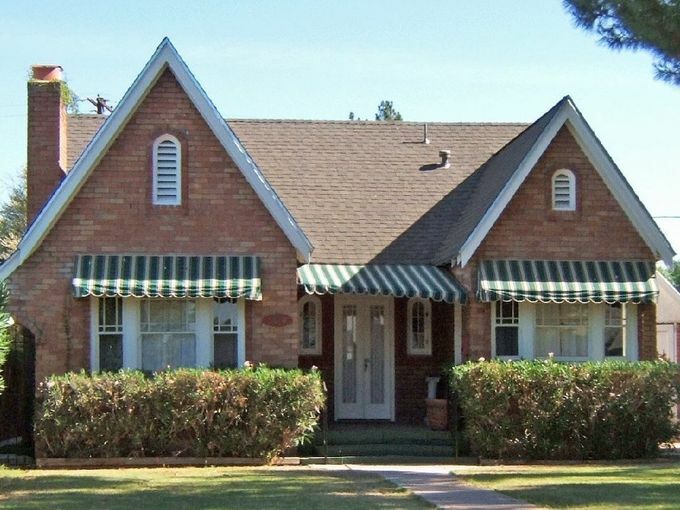 The early Ranch Style house, a simple brick structure with projecting gabled wing was an economical design, fashioned to meet the FHA guidelines. The “L” shaped design was typically ornamented with brick work and trademark small, circular window beside the front door. This style gradually eclipsed the Period Revivals to become the second most prevalent style of architecture in the district. With the onset of the Second World War, growth again was stifled. The war years marked the most restrictive period of regulation in the history of the American housing industry. From 1942 through 1945, Del Norte saw the construction of 21 homes under the bureaucratic scrutiny of no fewer than four separate federal agencies. Citizens looked to these agencies for building permits, rationed Resources, Links & Information, and direction through the maze of restrictions and guidelines. Homes developed under the federal war programs were limited to those constructed for war industry workers. House dimensions and the number of rooms were dictated by family size and ages. And materials, primarily rubber, metal, and wood was rationed. Substitution was the order of the day. Doorknobs changed to glass from metal, tiled showers and ceramic bowls replace cast iron tubs and sinks, and plastic substituted for rubber. By the early 1940’s, the architecture in Del Norte had evolved to the style of French Provincial Ranch. 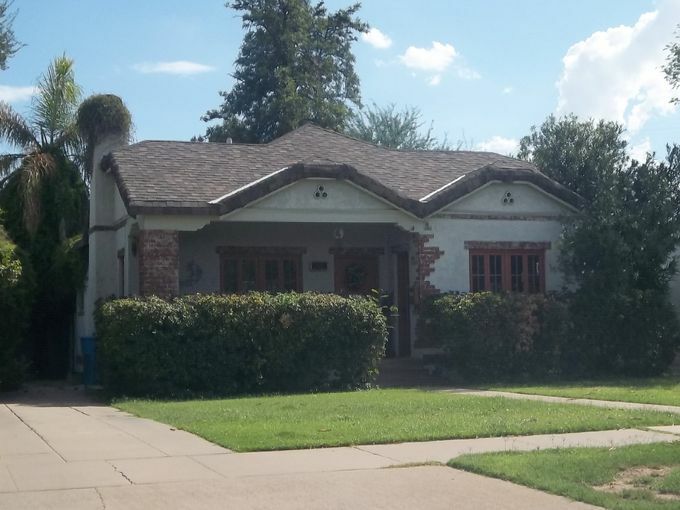 Characterized by the “L” shaped or irregular floor plan, a low pitched hip roof sheathed with wood shakes, and steel casement windows, 24 of these popular homes were under construction in the neighborhood in 1941. While the war slowed construction, the Ranch Style took firm hold, and its variations would soon come to dominate future construction. This final phase was yet another evolution of the Ranch Style home. A simplified form of the French Provincial Ranch was christened the California Ranch. A gable identifies these homes or hip roof extended over the entire house, brick wainscoting around the exterior wall, and a board and batten, or painted brick on the upper wall surfaces. 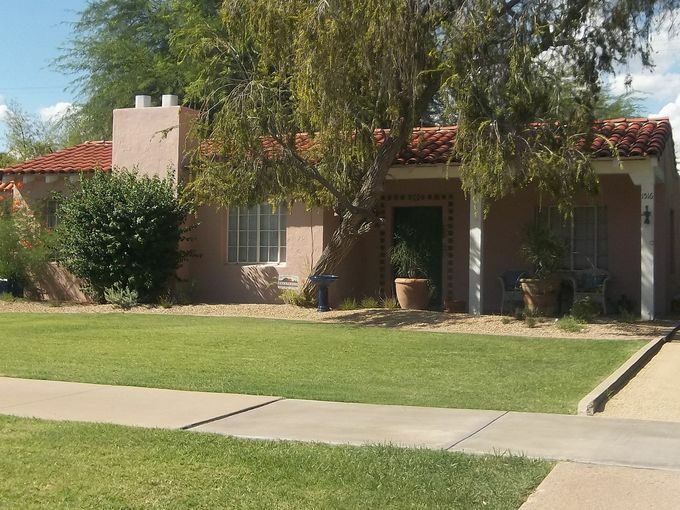 Thousands of these homes were built in Phoenix during the 1950’s, personifying Phoenix as a postwar, suburbanized city. Del Norte Place Historic District stands today as an island of style and grace within the central city. A tribute to Dr. Norton and long range city planning, the neighborhood enjoys the pastoral atmosphere afforded by the surrounding greenbelt of Encanto Park and Golf Course. Historic Del Norte House, just to the north, now stands, surveying a unique collection of homes representing 16 individual architectural styles and the dramatic evolution of 20th Century Phoenix. Recent trends toward historic preservation and the re-population of downtown areas have arisen from a recognition and appreciation for the architectural values, community spirit, and quality of life issues that originally inspired the creation of neighborhoods like Del Norte Place. In 1992, residents formed the Del Norte Neighborhood Association to promote restoration and preservation of the district’s heritage ensuring a solid future for Dr. Norton’s “beautiful sedition” in Phoenix’s’ 21st Century.